A rosy picture of cheap renewables is put forward by Bloomberg, but they rely on ‘promises’ and ignore the true logistics of plastering the world with their Hollywood-style vision of wind turbines, solar panels and industrial-scale batteries. The extravagant claim is made that ‘the concept of the need for baseload generation is fading away’. How’s that going in Australia for example? The world’s biggest scientific experiment is on course to become the most expensive source of surplus power. With wind-farm campaigners starting to promise subsidy-free power by 2025 and electricity demand in Europe stagnating, the future of fusion research looks bleak. Components of the 20 billion-euro ($24 billion) project are already starting to pile up at a construction site in the south of France, where about 800 scientists plan to test whether they can harness the power that makes stars shine. Assembly of the machine will start in May. Unlike traditional nuclear plants that split atoms, the so-called ITER reactor will fuse them together at temperatures 10-times hotter than the Sun — 150 million degrees Celsius (270 million Fahrenheit). Its startling complexity, with more than a million pieces and sponsors in 35 countries, mean questions remain about over whether the reactor will work or if it can deliver electricity at anything like the cost of more traditional forms of clean energy. With wind-farm developers starting to promise subsidy-free power by 2025 and electricity demand stagnating, even the project’s supporters are asking whether ITER will ever make sense. ITER, short for international thermonuclear experimental reactor, was supposed to offer plentiful power from a zero-pollution source when governments started it in 2006. Now, as wind and solar farms spread, some without the help of subsidies, ITER in Provence is still decades away from proving whether its scientific theories can be put into practice. Tokamak and other forms of Fusion have cost many £$Billions and a few months ago the most advanced example managed to hold plasma for a few seconds. They have little idea when the reaction will be ongoing. If the same money had been spent on Off-grid generation and hydrogen clean energy there would not be any need for the grids and expensive infrastructure. POIGNANT and excellent summary of the completely flipped-out world we live in today…. CAN’T wait to repost this in ten years time when the age of collective eco-insanity abates. The ITER blanket, which covers a surface of 600 m², is one of the most critical and technically challenging components in ITER: together with the divertor it directly faces the hot plasma. Due to its unique physical properties (low plasma contamination, low fuel retention), beryllium has been chosen as the element to cover the first wall. The rest of the blanket modules will be made of high-strength copper and stainless steel. Is this really clean energy? Engineers who know the grid say all the rotating machinery tied directly to the line (stored energy) helps stabilize the grid. Get rid of that and there is no “inertia” at 60 (50) Hz. Baseload (generation, loads) is in fact essential to the current design of the grid. Well yes. Hydrogen is clean energy. Now where is the energy to make the hydrogen going to come from? And there is the little problem of hydrogen being a “leaky” gas. It is difficult to contain at reasonable costs. And then you have the usual conversion losses. Yes, until we all have to have electric cars. Then what do they think is going to happen to demand? Is there nobody who writes for any meaningful journal with any ability to see the whole picture? Isn’t that what editors are supposed to do? 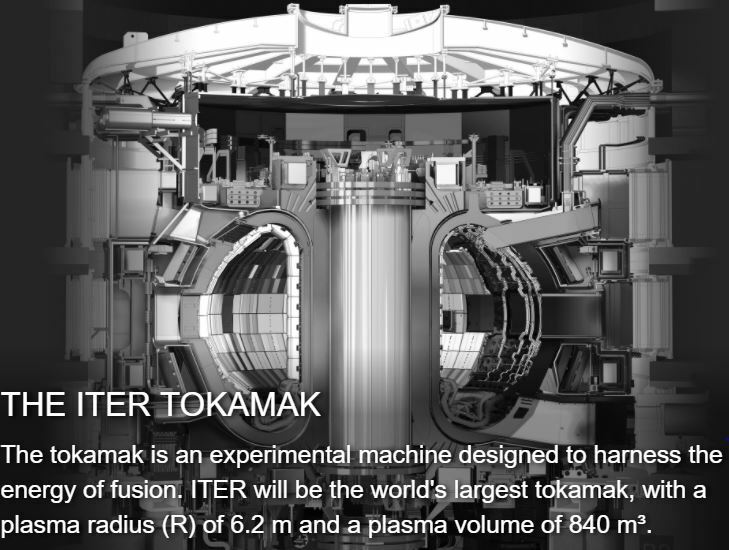 ITER is not supposed to generate power; quite the contrary, it will consume staggering amounts of power. It tests a feasibility of a sustained thermonuclear reaction. Once that is achieved (50 years in future as always), other machines will have to be designed to harness all that power. Why have you banned me? That will never happen. The German wind subsidy farmers are saying that they will go out of business when the subsidies are ended in 2020 and are scrambling to get the subsidies continued. Only because it is too expensive to use. When they get that cost down, without subsidies, to the same, or less, than coal fired generators, without the punitive green taxes, then it might be considered if, and only if, they can guarantee 24/7 supply. Until then the unreliables will remain unaffordable unreliable power. In the real world the renewables dream becomes ever more like a nightmare. A backlash of epic proportions is building over rising prices for energy. A de facto class system has emerged, saddling Germany’s have-nots with higher electricity bills that help subsidise the installation of solar panels and wind turbines of the well-off green elites. Germany has spent an estimated 189 billion euros (about $222 billion) since 2000 on renewable energy subsidies. But emissions have been stuck at roughly 2009 levels, and rose last year, as coal-fired plants fill a void left by Germany’s decision to abandon nuclear power. That has raised questions — and anger — over a programme meant to make the country’s power sector greener. I was excited: Subsidy-free “renewable” energy! Ah, no, just Bloomberg and cronies( yes, cronies) assuring the sucker-taxpayers that $1 per Kw was coming even with coal. Maybe someday the subsidies will be gone. Subsidies will remain until the cronies make money while failing.